Eliminating HS Classification complexity and making expertise available to decision makers and technicians who need to get answers instantly, consistently, and accurately. Harmonized System (HS) classification is the first and most important step in every crossborder transaction. HS codes tell Customs systems “what” is being imported or exported, they specify the duties and other fees that are assessed, and they determine the ultimate admissibility of goods. The unfortunate truth is that, until now, HS classification was the most difficult task in international trade – 1 out of 3 customs entries is misclassified and more than $22 billion in duties is incorrectly paid according to government reports. What’s more, HS classification remains a manual and time-consuming process, requiring deep domain expertise and years of experience. 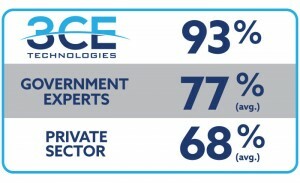 3CE was developed with the understanding that American companies spend more than $100 billion a year paying their employees to search for external information, and more than half of the information they find is useless. Our groundbreaking Commodity Classification Engine overcomes the problem of having to arbitrate long lists of mostly irrelevant and often erroneous “potential” matches, which is a common feature of other classification wizards. 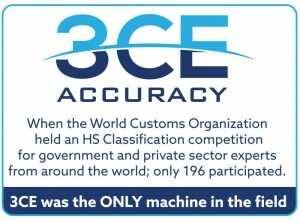 3CE stands alone in its ability to understand everyday product descriptions and link them to their one correct HS code – allowing procurement, compliance and logistics professionals of all abilities to classify with the highest degree of efficiency and expertise. We are the acknowledged leader in HS classification. We were the first and remain the only company to use artificial intelligence as a means of bridging the gap between how goods are described commercially by importers and exporters and how they are expressed in national tariff schedules. 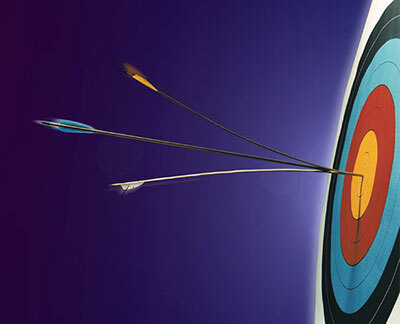 Ours is the only classification tool to have been tested against and outperform human experts. Requires deep domain expertise. Useful for experts. e.g. “Paper Shredders” are classified under 8472.90. Requires no domain expertise. Useful for anyone. Correct classification of imports has always been difficult. The increase in tariff rate lines, the explosion of imports and the variety of new products being imported complicates the classification of merchandise. 3CE is simply the best HS classification software I have ever seen. It would take us ten years of training to get one of our officers up to 3CE’s level of competence.